DC’s mature reader Vertigo imprint has published some of the greatest horror comics of all time, from Sandman’s serial killer convention to Swamp Thing’s existential body horror, so it’s only fitting that rising superstar of the macabre Lauren Beukes (Broken Monsters, The Shining Girls) should call the publisher home for her first ongoing series. 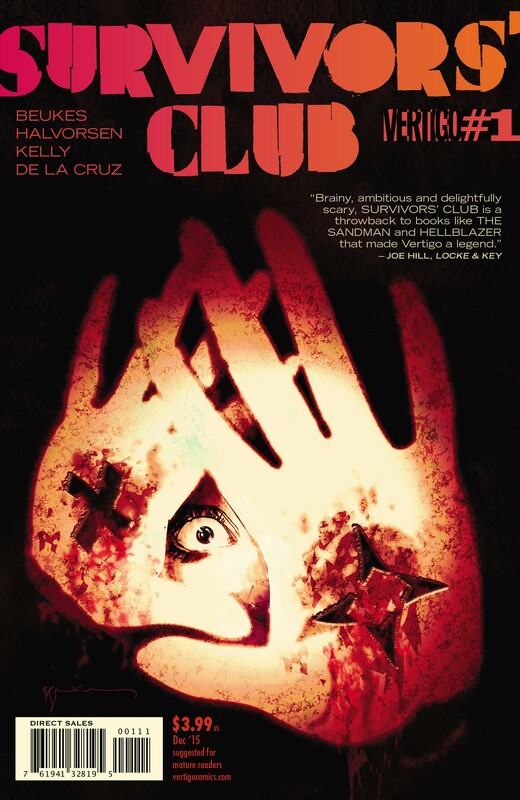 Co-written with longtime friend Dale Halvorsen and drawn by Vertigo stalwart Ryan Kelly with painted covers by comic legend Bill Sienkiewicz, Survivors’ Club is a nightmarish oasis for fans of the horror genre. In 1987, a host of sinister events happened to a disparate cast of young people: a video game opened a portal to Hell, a doll came to life, an invisible friend whispered murderous words into a susceptible ear. Now, almost 30 years later, one survivor suspects there’s a larger thread connecting the children who escaped their traumatic ordeals. Paste chatted with co-writers Lauren Beukes and Dale Halvorsen over e-mail to discuss their plans for the series, how horror has permeated the public consciousness, and their own chances of surviving the night. Vertigo is also debuting an exclusive 6-page preview of the first issue, which launches this Wednesday. Paste: Lauren, your horror novels are set in America. Chenzira, who brings the cast together, is from your native South Africa. What about her South African background affects her adult life in LA, or the way those around her reacted to the events of ‘87? Lauren Beukes: She grew up under the extreme oppressive racism of the apartheid government and her mom, a freedom fighter, was killed in police custody. As a kid, playing video games at the local arcade in Soweto became her escape from the monstrous society around her, but then the game she played opened a doorway to allow real monsters through. A running theme in my work is how we’re haunted by the past, how those monsters come back to bite you, and Chenzira is very aware of that because of her personal and political and supernatural experiences. It’s made her keenly focused and driven to confront her demons head-on, which is why she called the other survivors together. Her mom taught her to speak out against injustice and she’s acutely aware of the cost of fighting for what you believe in. It comes through in her work, too. Sure, she teaches a light subject, the philosophy and sociology of video games, but she uses games as a way of critiquing and exploring big social issues. Paste: Dale, you mentioned being inspired by a viewing of Child’s Play, and most of the cast’s back-stories have some connection to ‘80s horror classics. Kiri’s haunting is pure J-horror, though, which is a much newer phenomenon in the English-speaking world. Is it challenging to make these different pieces fit together into a cohesive whole? Dale Halvorsen: Not at all, it just means we have a bigger world to explore. That’s what made the movie Cabin In The Woods so fun, because it folded a lot of different genres into one story. The classic horror stories have almost become our generation’s fairytales. Freddie and Jason and Candyman are our Big Bad Wolfs. People know them so well and they think they know what’s going to happen next, so it’s interesting to take those preconceived ideas and push them in horrible and unexpected ways. Paste: You’ve revealed that Inaki Miranda will be doing guest issues. Will these dig deeper into what happened in 1987, and is there a chance we’ll see some of the kids who didn’t survive their ordeals? Beukes: I love working with Inaki! We previously did the J-horror Rapunzel story Fairest: The Hidden Kingdom together. 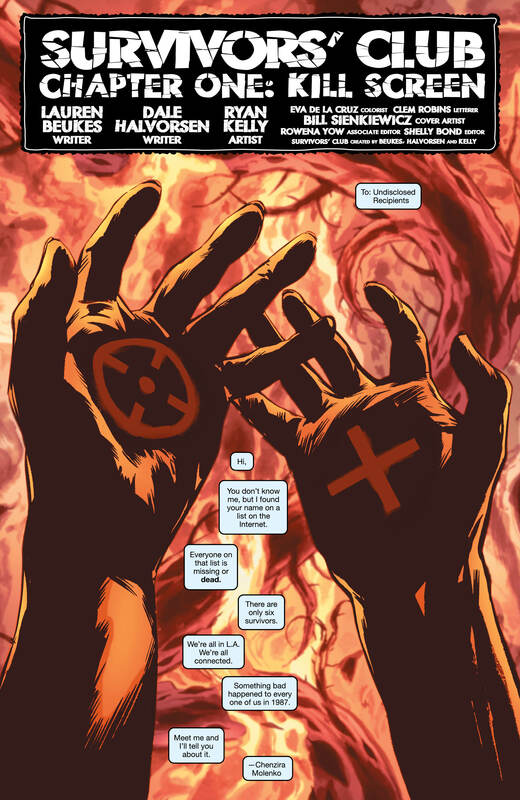 In Survivor’s Club, Dale and I thread flashbacks through all the issues, giving you small, shocking pieces of the puzzle along the way, but Inaki’s standalone issues allow us to explore a single backstory in much more detail—and with his insanely horrifying art! The first standalone is issue four, which gets into the belly of the beast of the Muskagee House—our take on the classic demon-possessed-kid-haunted-house story. Halvorsen:: Most definitely. There’s another survivor coming up who will reveal a lot more about why this happened to these particular people. Our six survivors are the ones who managed to hold their lives together despite what happened to them—you can only imagine what some of the others went through, and we’re definitely going to have some run-ins in the future. Paste: Lauren, you juggled a large cast in your most recent novel, Broken Monsters. 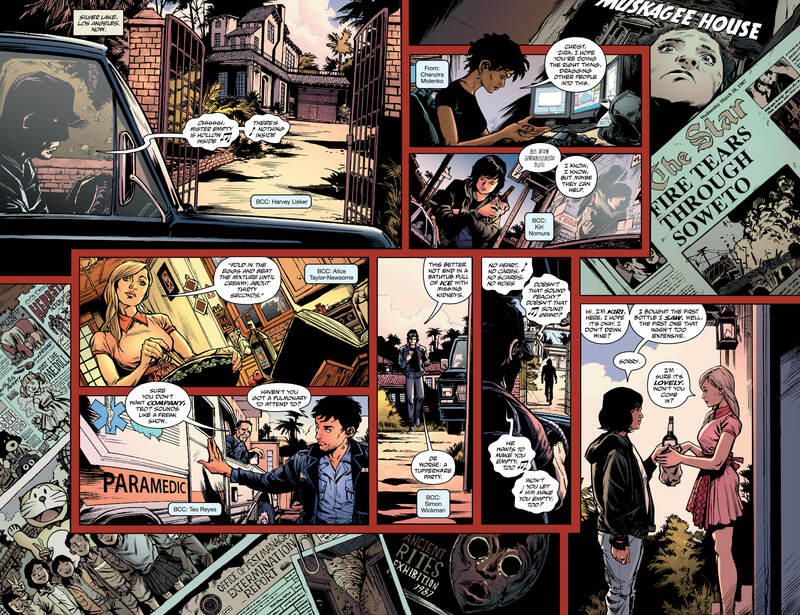 What made Survivors’ Club a story you wanted to tell in comics instead of prose? Beukes: Because it’s so much fun to do as a comic. I’d been pitching comic ideas to Vertigo for three years and when Dale came up with this idea, it was so simple and elegant and clever as hell, I knew it would work. The concept is very visual. Comics just felt right, although it is much harder juggling a large cast in a comic book. It’s like a horror super team, all with their own dark secrets and terrifying back-stories and little reason to trust each other, so we’re dealing with the over-arcing mystery, the immediate mystery, and all their back-stories. Paste: You’re longtime friends co-writing for the first time. How have things broken down, work-wise? Have you been marathoning scary movies together? Beukes: I’m used to writing on my own, which means long, lonely hours with the imaginary people in your head. It’s been so much fun to work with Dale. As he says, our writing and plotting sessions are “like creepy playtime” where we try to think of the worst possible things we could put our characters through, how to push the horror level to surprising and diabolically evil places, and generally try to freak each other out, (which is just greeeeeeaaaaat when Dale goes home and leaves me alone in an empty house with the monsters of our imagination). Although I have more experience in actual writing, Dale is brilliant at plotting and coming up with vicious twists. He also does a lot of research, listening to podcasts and digging up weird articles and documentaries. I am a little afraid of what our search history says about us. Halvorsen: I have a lot more tolerance for schlock than Lauren does, and I work-watch a lot of bad horror movies in my day job as an illustrator, because you can learn a lot from bad movies. When we watch horror movies together, it’s the good stuff. Most recently, It Follows, Goodnight Mommy and the Iranian vampire western, A Girl Walks Home Alone At Night. I’ve learned a lot from Lauren: that writing is hard and writers will do almost anything to avoid writing. And there’s a fair amount of acting involved, when we stage the scene and try out the dialogue. Thank Cthulhu for improv classes. Paste: What can you tell us about your artistic collaborators on the series? Does Ryan Kelly share your love of horror? How does it feel to have your words behind Bill Sienkiewicz covers? Beukes: Ryan is all about the cinematic mood. He’s amazing at crafting disturbing angles and points of view. I don’t think he’s a big horror fan, which means we get to send him lots of references and try to freak him out. It’s all about equal opportunity scares. Halvorsen: Ryan has taken our original ideas for the characters and fleshed them out amazingly and added Easter eggs and layers of depth. He also thinks about details we don’t even consider, like whether the uniform is cosplayable. I’ve always admired Bill Sienkiewicz’s covers for Dazzler and New Mutants. I grew up with them and it’s almost his fault I became a cover designer, because I looked at the zombie Dazzler cover and thought, How do you get to do that for a job? When Shelly [Bond, Vertigo editor] suggested him and I put the name to the work, my head exploded like a scene out of David Cronenberg’s Scanners and Lauren had to scrape up my brains and superglue my skull back together. Paste: One final question, in the spirit of the season: which horror movie do you think you’d have the best chance of personally surviving? Beukes: Yikes, so many. So many of the characters are just ridiculously stupid. I remember watching Vacancy most recently and yelling at the characters the whole way through. “For Pete’s sake, wrap your hand in a towel, smash the mirror, use a broken shard as a piece of glass!” This may come from my history of playing video games, especially the Sierra and LucasArts quest games, as well as the first person shooters. I spent my childhood looking at ordinary objects and trying to figure out how to combine them into useful tools. Halvorsen: I’m tempted to say Left Behind (that’s a horror movie, right?) because there’s no way I’d be Raptured.